Pictured above: Emily Borzcik, a senior program officer at the Institute of International Education’s Scholar Rescue Fund, moderates a panel discussion with Profs. Mustafa Bahran and Rahim Surkhi, who are being hosted at Carleton University through Scholars at Risk. Scholars at Risk is an international network of higher education institutions dedicated to protecting threatened scholars, preventing attacks on higher education communities, and promoting academic freedom worldwide. Our role at Carleton is to be one of the academic institutions within this network which provides threatened scholars the safety and support needed to continue their work. Carleton’s Scholars at Risk committee arranges one to two-year appointments in host departments across the university in partnership with the Scholars at Risk Network and the Institute of International Education’s Scholar Rescue Fund (IIE-SRF). 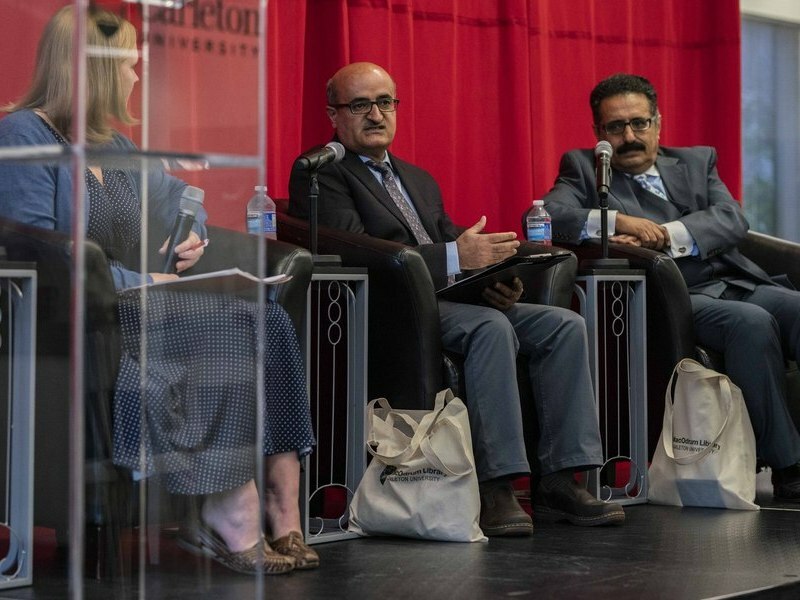 Carleton currently hosts two scholars; one from Iran and the other from Yemen. With your financial support, Carleton University will emerge as a global leader in the fight for academic freedom and human rights. Support Scholars at Risk by funding our efforts to provide a safe environment within our institution for scholars whose lives are threatened due to the nature of their academic work. We ask our alumni, faculty members, staff and the larger Ottawa community to invest in academic solidarity by donating here. When you invest in Scholars at Risk, you’re investing in the protection of knowledge and the world of ideas which will together advance our societies towards better, brighter futures. This is an opportunity to place Carleton within the ranks of global leaders fighting for academic freedom. The scholars that we will have the honour to host at Carleton will provide students, faculty and staff with a uniquely enriching academic experience. Donated funds go towards salaries for the scholars, living arrangements, administrative fees, research costs and more. Essentially, they will enable us to continue our mandate of protecting and supporting future scholars at risk and their ideas.